Concordia’s maintenance workers say they’re calling up retirees to fill gaps in the schedule. The university doesn’t pay enough, they explain, and they can’t hire new people because good workers can make more at another job. But for three senior administrators who took home salary increases of 20 per cent or more last year, Concordia’s pay is just right. These increases, which the university calls “retention adjustments,” were paid as incentives to keep the administrators at Concordia after they had received other job offers elsewhere. The three increases were paid on top of the 2.75 per cent pay hike given each year to all senior administrators. The three administrators are head librarian Gerald Beasley, chief communications officer Philippe Beauregard and vice president of institutional relations Bram Freedman. The past academic year was “sort of an unusual year, in terms of the numbers of increases that were above the norm, the 2.75 per cent that all the senior admin people got,” said Freedman. Freedman noted that the current fiscal year would not include as many large adjustments. “In the fall coming up, I can only think of one large adjustment that would be there,” Freedman said. That adjustment, he said, will be for Graham Carr, who was appointed VP Research and Graduate Studies after several months as an interim VP in that department. Several other administrators who moved to new positions, or whose job descriptions changed, also received salary adjustments. 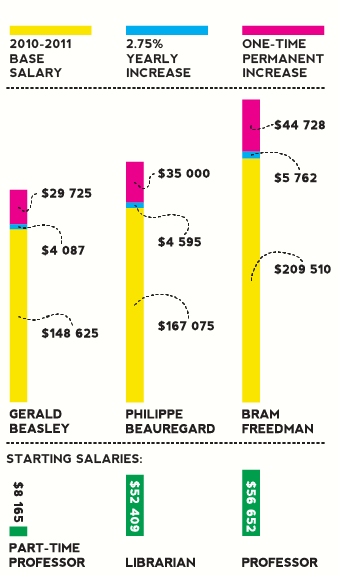 Russell Copeman, for example, is paid five per cent more as VP External Relations than in his previous position as VP Government Relations. Employees who have received a job offer would talk to their immediate superior about any possible retention adjustment, Freedman said. For VP-level employees like Beauregard and Freedman, that superior was former president Frederick Lowy. Beasley’s superior at the time of his retention adjustment was former provost David Graham. Retention adjustments are paid as permanent salary increases and count towards an employee’s pension. Full-time faculty members are also eligible for retention adjustments, but those adjustments are capped at $15,000 and are not permanent—after five years, the adjustment may be changed or removed entirely. And unlike retention adjustments for senior administrators, they do not count toward an employee’s pension. There is no cap on retention adjustments for senior administrators, but any increase must stay within salary guidelines for each position as set by the provincial government. Current Concordia President Alan Shepard told The Link last week that retention adjustments might sometimes be necessary, but that they are “not something you do every day. “We’re here trying to explain decisions that I wasn’t a part of—what I would say is they should be used sparingly,” he said.